In August, my cousins came to Chicago for Lollapalooza and to visit me of course. :) I think they were here for about 2 weeks and I think I gained 5 pounds after they left. We ate a ton and not surprisingly I had a long list of places for us to try. I don't think Chicago is necessarily known for BBQ, but Jung and Julie wanted to try it while they were here. Several people recommended Smoque to me in the past so I took them there. They have a pretty extensive list of ribs, brisket, chicken, pulled pork and sausages. 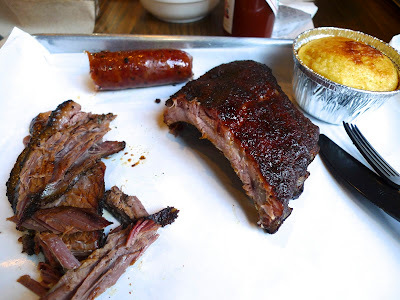 We ordered a few things to share, namely the St. Louis ribs which they explained was meatier and smokier than baby back ribs. We also got some brisket, which they are known for. We were in agreement, the brisket was definitely our favorite. It was moist and tender and had a nice crust of spices on top. 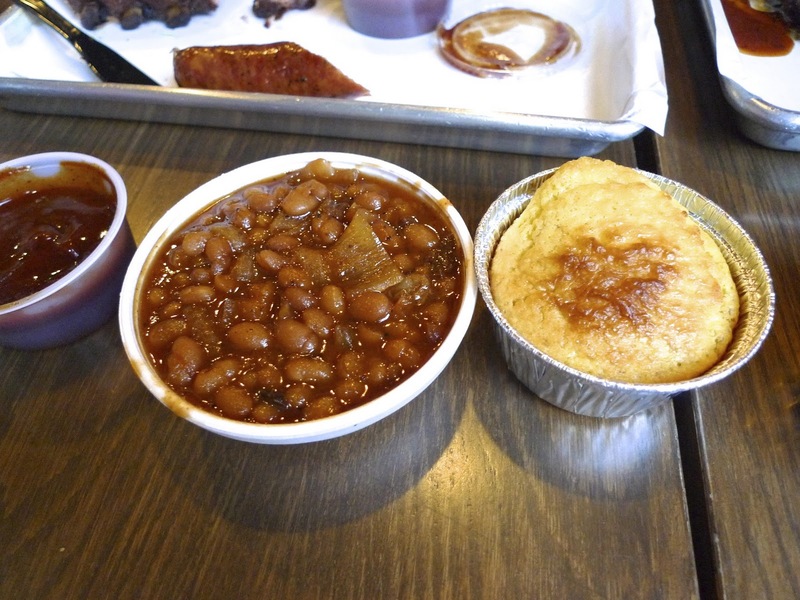 We also ordered their Texas sausage, which was also good, but we loved the brisket the best. 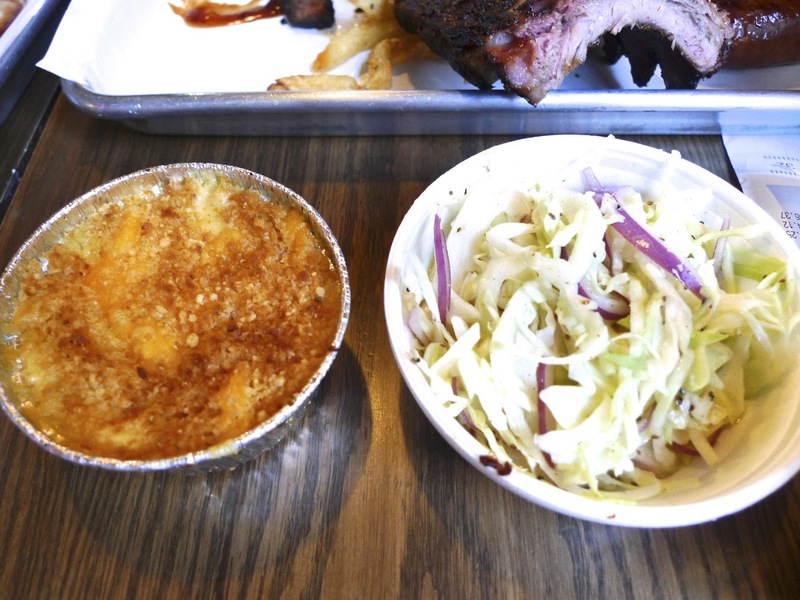 We also ordered a side of their mac & cheese and cole slaw. Here's a shot of the baked beans and the corn bread. It's very rare for me to like all of the sides at a BBQ joint, but I thought they were all really good. We were all really tempted to order another order of the brisket but we resisted because we knew we had dinner plans later that night, but it really took great restraint on all of our parts. A few days later, Julie still talked about how good the brisket was. I had wanted to take them again before they left, but we ran out of time. 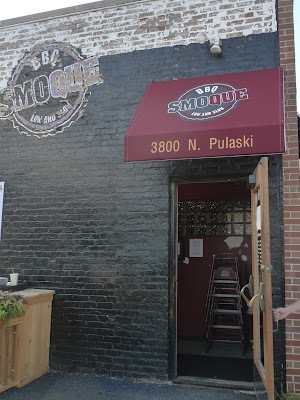 Now that I'm leaving Chicago, not sure I'll get to go back ... but hopefully one day, Smoque and I will meet again. If you live in Chicago, do me a favor and go get yourself some brisket from Smoque.